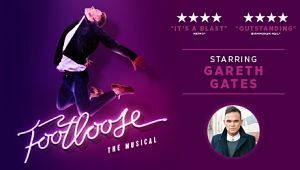 Footloose: The Musical is set to tour again next year with Gareth Gates playing the role of Willard. The show will be premiering at the Spa Bridlington in January before embarking on a major UKtour. The full cast has just been announced with Maureen Nolan as Vi Moore and Luke Baker as Ren McCormack. They will be joined by Hannah Price as Ariel Moore, Nigel Lister as Reverend Shaw Moore, Nicky Swift as Ethel McCormack, Joanna Sawyer as Rusty, Matthew Tomlinson as Chuck, Natasha Brown as Wendy-Jo, Miracle Chance as Urleen and Scott Haining as Bickie with Lauren Storer, Natalie Morton-Graham, Luke Thornton and Alex Marshall.